Over at Seize the Birthday this time around we have a rather simple toppings option. This time it’s either Pennants or Banners….or both! The choice is yours. Also, remember you don’t have to use the topping, just any kind of Birthday card and or project will do. So what are you waiting for come on over at join the girls and I.
I think my card is rather easy to follow. I used the stampin up pennant punch and then decided that flags were to long so I trimmed them down. The pennants were all decorated and or embossed in one fashion or another and adhered with pop dots. The sentiment is from Verve. The paper is a hodge podge of this and that. The heart border is also from Verve. I am in love with this die! I decided I wanted to do a better job at hiding the pen drawn lines, so I covered most of it with some gems. Hope you have a wonderful day and hope to also see you over at Seize the Birthday! Take care and I appreciate you stopping in and your comments truly make my day! Categories: Cards | Tags: Card making, Cards, embossing, Happy Birthday, rubber stamps, stamping, Verve Stamps | Permalink. 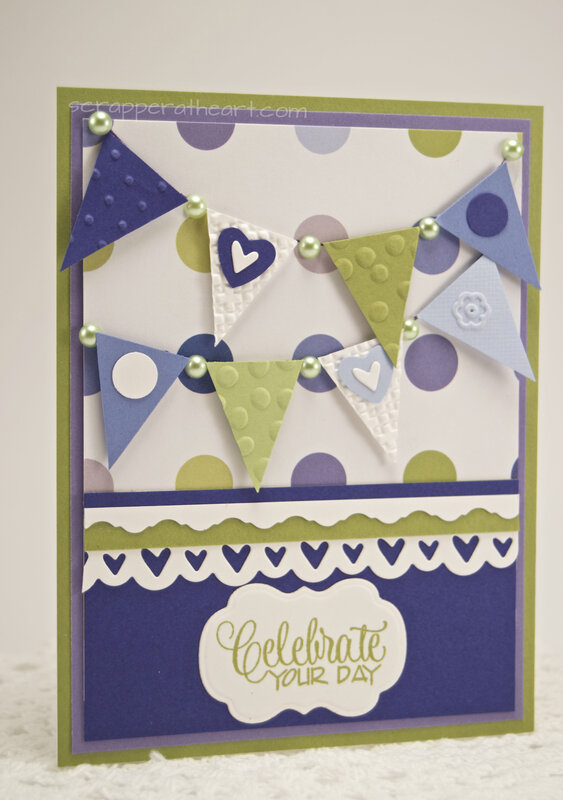 Love the colors in your card and the sweet pennants. I love your color combo, Nancy, and the design of the card. Hello… hello. How I’ve missed thee. I do..I do… I’ve been keeping somewhat lately.. lots of busy work on the home front. I had to stop by and tell you how much I love this color combination and beautiful banners. Stunning as always. Hope you are doing well..Big hugs being sent your way. LOVE the textures on your banners! Pretty colors, too! FAB card, Nancy! Great design and fabulous colour combo! Love it! I love the colours you chose and you can’t go wrong with polka dots!! I love this card Nancy, the colour combo is gorgeous and those little hanging banners with the pearls in between look so effective! How absolutely bright and adorable! This would definitely make anyone’s special day that much better. Wonderful card, I love the papers and colours your used.